By Saad T. Farooqi: La La Batalla II is a fight that is going to answer two looming questions. One, did Antonio Margarito really cheat against Miguel Cotto in their first fight? Second, it will serve as measuring stick in seeing how much these two warriors really have left in them? While the venue is still up for grabs, I wanted to draw people’s attention to what really is of importance: who is going to win the most anticipated rematch in recent memory, La La Batalla II. 1) Power: Margarito is a 5’11” guy whose natural walking weight is around the middleweight region (160~pounds). All that extra weight is more natural on his frame than it would be on Cotto’s. Cotto too is a natural 160~pounder but he’s 5’7″ a weight that makes him bulky. As a general rule, the taller bigger guy will be stronger than the shorter lighter guy. Margarito may also try to bulk up after the weigh-in, having gained 20~pounds (stupid move actually) for the Pacquiao fight. 2) Speed: Cotto. Pretty obvious. 3) Stamina: Margarito. Hands down, this guy has a monstrous stamina and endurance as witnessed in their first fight and his fight with Pacquiao. Most of his famous fights were all distance fights or championship fights. Paul Williams, Joshua Clottey, Miguel Cotto and Manny Pacquiao were all fights that went or nearly went the distance. 4) Chin: Margarito. Anyone who watched their first fight knows that this guy has a granite chin. That chin was also on display in his lopsided fight against Pacquiao. Then again, that was the fight he was weighing 17 pounds more than Pacquiao so his chin should’ve been holding up as far as “boxing theory” goes. In this fight though, it still needs to be determined what he’s capable of when both he and his opponent are natural middleweight guys. More importantly, it still remains to be seen if those dents in his chin that Mosley and Pacquiao put on his chin will actually hold up against someone like Cotto. 5) Heart: I’d give it to both of them. Cotto has a monstrous heart as displayed in his fights against Margarito, Mosley, Clottey and Pacquiao. Based on their face-off thought it’s obvious that Margarito is “hungrier” given that he’s willing to die in a fight while Cotto only looks at it as a job. Still, Cotto, for someone only looking at it as a job, put all the heart and guts on display in his fights as you’d expect from a bonafide warrior that he’s come to be known as. But if I had to chose, I’d give Margarito the slight nod given that he’s willing to die in the ring and Cotto isn’t. After all, even in their first fight, Cotto explained that he asked for the fight to be stopped because of his family. 5) Technique: Cotto. No question. Even in their first fight, Cotto was running circles around Margarito for the first 7 rounds until the plaster drumming or running out of gas (or both) got to him. Neither of them has been the same since their first fight. Cotto has had a series of ups and downs in his career, with both him and Margarito getting smoked by Pacquiao and staying out of the game for nearly a year since 2008. Margarito hasn’t had any kind of success since then, getting annihilated by Mosley, having a forgettable performance against a no-name Garcia and getting steamrolled by Pacquiao. 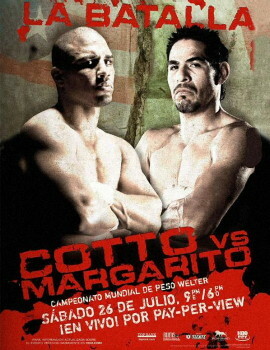 Cotto, however, has had some successes in a way that Margarito hasn’t. Cotto has looked good in his last two fights and the surgery he had on his right arm has brought back some of the pop he lacked in his previous 10 or so bouts, thus making him a two-handed fighter again. He’s also got his confidence back due to his wins and with vengeance on mind, he seems more focused than ever before. On top of that, the damaged right eye of Margarito will make for good target practice too. Margarito, still, has all the heart and guts you’d expect of a proud Mexican boxer. Having already beaten him once is all the confidence booster Margarito will ever need. On top of that, plaster or no plaster, Margarito is still a big strong Mexican, still the same guy who nearly knocked out Manny Pacquiao with a single body blow. Most of all Margarito, style-wise, will always be a tough opponent for Miguel Cotto: a high pressure volume puncher. Ever since Miguel Cotto’s fight against Lovemore Ndou, it was obvious that the Puerto Rican star has a trouble with high pressure. Since then, all his fights that he had problems in were against pressure fighters. Cotto win strategy: More than the plaster, more than the high-pressure and volume punching, what worked against Cotto were two major mistakes. One, staying on the ropes in their first fight. Secondly, and this is the mistake almost no one points to, is that Cotto DID NOT go to the body against Margarito at all. Almost never. Margarito is actually vulnerable at the body as Mosley showed which makes Cotto’s reluctance to body punch him in their first fight that much more absurd. Additionally, Cotto will also need to tie up Margarito like Mosley did and work on his conditioning like never before because against high pressure fighters, staying on your feet is the key to staving off that pressure. And most importantly, Cotto shouldn’t go for the knockout like he was in the first fight. It led to him headhunting the entire time and punching himself out. Margarito win strategy: Pretty much what he always does. Put in high pressure, work on those vicious uppercuts that Cotto’s defence has always been weak against and force him to the ropes. If anyone developed the blue print at beating Cotto, it was Margarito. While the “tale of the tape” above does seem to give Margarito the edge, boxing is as much about the intangibles as it is about the tangibles. And it’s the intangibles that make this bout so interesting. One man has the mental edge in feeling that just vengeance is at hand. The other has the mental edge in having a prior knockout victory. One man has shadows in his mind about the boogie man who could very well still hurt him. The other has similar doubts if the recent cracks in his chin can withstand the punches like they did three years ago. Ultimately though, this is boxing. This is a sport of intangibles and tangibles. This is a sport where it doesn’t matter if you’re evil or good, benevolent or cruel, an honest warrior or a soulless cheat. What matters is fortitude. What matters is who is standing in the end. All legacies, all justice, all disputes and grievances–everything is decided by the punches these fighters throw.